We’re either in India, or that elephant is one freaky-deaky hippy. 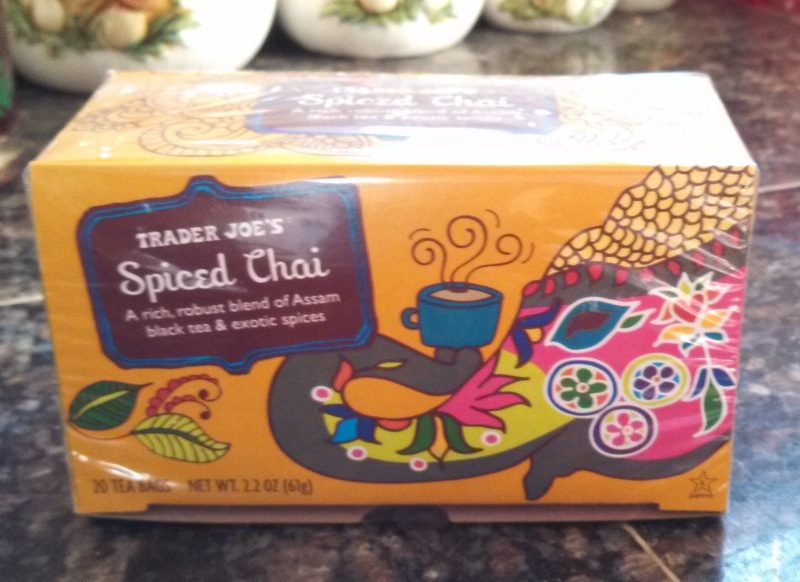 After rebuffing, then falling in love with, then losing Trader Joe’s Harvest Blend Tea, I nearly leapt with joy when I saw Trader Joe’s Spiced Chai on the shelf. Could it fill the hot drink void in my life? Certainly I’ve enjoyed just about every cup of chai I’ve ever drunk, so it was hard to imagine that a Trader Joe’s tea wouldn’t manage to clear that rather low bar. I’m delighted to report that Trader Joe’s does manage to hit that rather easy target, and earns a few bonus points to boot. The first thing to know about chai tea is that chai literally means “tea” in numerous languages, so any time you say “chai tea” you’re actually saying “tea tea” and that’s just silly so, you know, knock it off. Trader Joe’s nimbly side steps this common error by naming their tea Spiced Chai, which is a very deft bit of wordsmanship. They avoid the sort of nit-picky redundancy grammar jerks like me enjoy pointing out, while simultaneously being exactly technically correct (seeing as this is a spiced tea) and drops in a neat descriptor that makes their chai sound quite tasty. I go pretty hard on TJ’s marketing wonks around here, but whoever came up with this one deserves a sweet cash bonus. The chai we commonly think of in America is more accurately called masala chai, or “mixed-spice tea” in Hindi. Like most folk foods, such as ajvar, there isn’t one official spice mix that makes up “real” chai. Despite that, Trader Joe’s chai mix would undoubtedly pass snuff on chai wallah carts up and down Assam. No sooner do you flip open the box then that redolent, nose-twitching bouquet of bewitching spices bursts out, screaming chai left and right. Trader Joe’s Spiced Chai hits upon all the usual chai notes – cinnamon, ginger, cloves, cardamom, star anise – and adds their own special mix of nutmeg, roasted chicory, black pepper and vanilla bean. All this is mixed into the background of a very satisfactory black tea from the original stomping grounds of masala chai, Assam. I ran this tea two ways – with milk and straight black. Both ways satisfied. You have to give the bag a good long steep to be sure – at least 6 minutes, particularly when mixed with milk – but once you do the strong, complex spiciness of the chai blooms to fill the cup wonderfully. The least I can say about TJ’s Spiced Chai is that it delivers exactly what it promises. There aren’t any surprises here, but there don’t need to be. The tea is flavorful and warming, and priced at only $1.99 for 20 tea bags. What more can you ask for? Would I Recommend It: Yes indeed. Would I Buy It Again: At least until Harvest Blend comes back in season. Final Synopsis: A great way to get your at-home chai fix. I’m glad you wrote about this one. I stockpiled the Harvest Blend but considered picking up the Spiced Chai last week. What I liked about the HB is that I could drink it at any point in the day. Whereas the Spiced Chai would only be good in the morning. I’ll get one box this week based on your post. Just to try it. I tried their vanilla cinnamon winter blend… not a fan. Hmmm! Would you say it was better than the chai I served you? And I don’t know what instructions the pack tell you, but ideally tea bags should be steeped only in water, add the milk later (ideally hot milk so as to not cool down the chai!). Also, thank you! ‘chai tea’ is the most ridiculous phrase I ever heard! And it gets even more ridiculous when you consider how Starbucks opened up in India and served up their chai tea lattes to the Indian population, and of course the hipsters all rushed in to order their ridiculously expensive chai tea lattes! Oh well! I can’t wait for the day you come to India and I take you to taste the roadside chai that will forever change your tastebuds! There were no instructions on the pack, just a sort of vague suggestion of preparing the chai with milk. I did my best! Can’t wait to get some authentic chai with you in India, Juhi! I just bought this tea and love it. I like any Assam tea and any masala chai, so it was a shoe-in. Since you call yourself a “grammar jerk,” I must point out a homophonic error in spelling. You say “no sooner then” when it really should be “no sooner than.” Mixing “than” and “then” is a common error these days. Watch out for it!! how much caffeine in a TJ’s Spiced Chai cup? The average 12oz mug of black tea has about 70mg of caffeine, whether it also contains chai spices or not. Of course, it all depends on how you brew it and mix it. If you have 6oz tea and 6oz milk, of course you only count the caffeine for 6oz of tea.